At the beginning of June 2013, my boyfriend and I went to what was supposed to be one of the happiest moments of our life. Our 12 week scan. But it was here we found out that our little Peanut’s heart had stopped beating 2 weeks earlier and words still cannot describe what emotions and feelings washed over me to this very day. At first I didn’t want help, I just wanted my baby back, and I sat indoors day in and day out crying and pining. My boyfriend had to go back to work after a week and a half, but I had just been made redundant so this is when I truly felt alone and there was no one there to talk to or support me when I most needed it. This is when I found the Miscarriage Association whilst browsing online and looking for forums in which I could talk to other ladies about what I had been through and to feel like I wasn’t alone, someone where I was actually allowed to share my story and feelings without being judged. Before this had happened to me, I had no knowledge at all on the subject, I thought it was a rare thing that happened to some people, but of course always thought it would never happen to me. After talking to other ladies online and finally building up the courage to go to the London Support Group and Guys Hospital (where I met a lady who I cannot thank enough for here continued love, support and courage and now consider one of my best friends!) I felt strong enough to pick myself up and move forward, look for a new job and slowly but surely get myself out of the house. After Peanut’s due date passed in December 2013, and the one year anniversary of our 12 week scan coming up in June 2014, I decided that I wanted to do something, not only to thank the MA but to show support and raise awareness for other women who had nowhere to go after this truly heart wrenching ordeal, but also in honour and remembrance of our little Peanut. I have never been a big participant in sport and would probably say running is my worse sport overall. 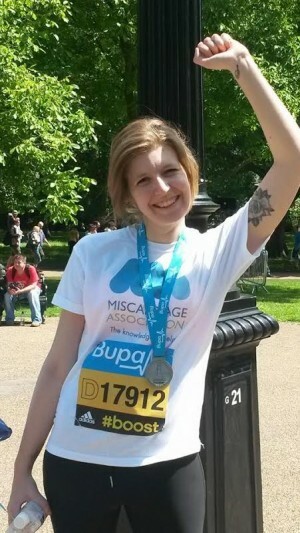 But my boyfriend is a keen runner and this inspired me to challenge myself and I later signed up to run the London BUPA 10,000 on the 25th May! The day finally came about and I was so nervous, I was unable to train as much as I would have liked due to a constant busy work schedule, and I was scared of letting people down, but as long as I finished it, no matter the time, I would have done something to be so so proud of! My boyfriend came with me to watch, and I knew that my aunt would be arriving sometime during the race. My mum had work commitments and couldn’t come which was something I was quite upset about. But the race went really well, the weather was amazing and everyone was so supportive throughout the whole course. As I finally got to the last 300m stage all I could think about was my little Peanut, he/she was there with me, pushing me that last little bit until the finish line. Then I heard my mum shout ‘SAMANTHA I LOVE YOU!’, and the tears came streaming down my face, 100m before the finish line. I was so glad I was making people proud, I was making myself proud and I hoped that I made my Peanut proud. My finishing time was 1h16min which was so incredible for me! And I raised £350 for the MA prior to the event.